The papercraft style treatment is ripped from a radial gradient tutorial I saw on the web, but I used it a differently for this logo. The next one here is from a little hobby of mine. I keep a list of names for my super awesome game development studio that I’m going to start after I make my first billion. One name near the top is Überifica. Based on Black Slabbath, the pixel-block nature of the Ü letterform will make a great icon. In the middle is my favorite color treatment, and the bottom is a little retro tribute to the demo scene. This entry was posted on February 25, 2010. It was filed under Art, Default. 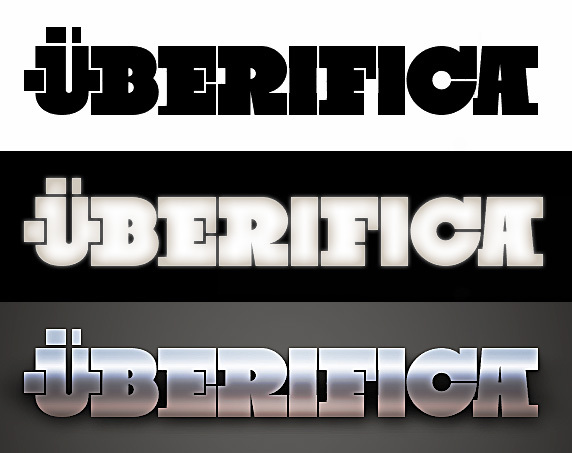 Agreed, really love the type treatment for Starfunk.